A leaf from a Red Oak tree. Today is National Arbor Day! Happy National Arbor Day! The national tree for the United States is the family of oaks, known as Quercus. This is a leaf from a red oak tree. But there are many different varieties of oaks that grow abundantly in our nation. Among them are the: White Oak, Black Oak, Willow Oak, and an evergreen oak too – the Live Oak. 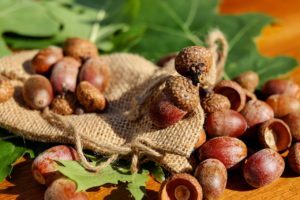 Oaks provide a great amount of shade, and their signature similarity is that they bear acorns! 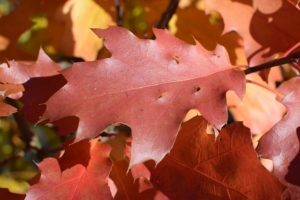 This Red Oak can be found to grow in hardiness zones 3-8. It is the state tree of New Jersey and Iowa. Be sure to look up and all around at the wonderful trees that surround you today! The Second Friday in April is Virginia’s Arbor Day! And its home state tree is the Flowering Dogwood. These leaves unfold a bit after the tree blossoms with its well-known 4 bract flowers. They are conspicuous (that is, showy) and herald the incoming of warmer spring weather. The leaves are somewhat egg-shaped and have deep veining. The tree is not as showy in the fall – the spring blossoms far outshine the fall coloring which is of a yellowish or purplish-brown. The bark is chunky and mosaic-like on this understory tree. Also the state tree of Missouri, it’s a pretty tree and is often used as an ornamental. Look for this tree in hardiness zones 5-9. 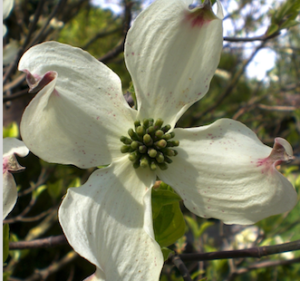 The Second Friday in April is West Virginia’s State Arbor Day! And its home state tree is the Sugar Maple. 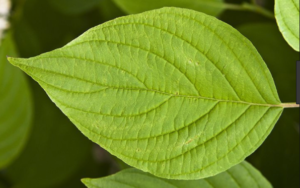 These leaves emerge as a bright spring green and mature to a darker green during the summer months. It has keys as seed/fruit that are like helicopter blades. It’s well known for the sap that gets tapped from it and is sold as maple syrup. Three other states have this as their home tree: New York, Vermont, and Wisconsin. It’s a great tree and hopefully, you’ll get to see one or more in your area. It is found in hardiness zones 3-8. 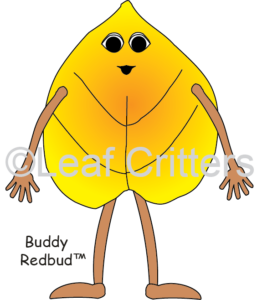 Leaf Critters will be an exhibitor this Saturday at the Matthews Earth Day on the Four Mile Creek Greenway Saturday, April 14, 2018. Come join us for green fun on the greenway! All of our teaching materials will be on display. These make a great (and unique) teacher’s gift for grades Pre-K – 5th! Please bring your checkbook for purchases. We look forward to meeting you! As you now know, each state has its own Arbor Day. And Oklahoma is next in line! Oklahoma uses an entire week to celebrate its arbor day. The celebration goes on during the last full week of March each year. This year the dates are March 25-31. 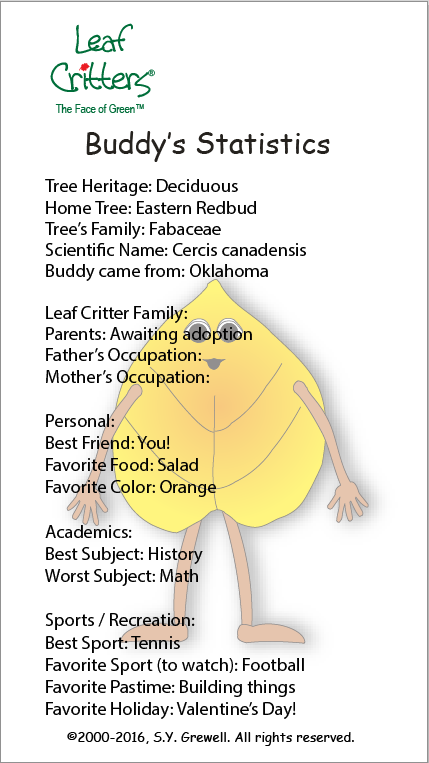 I’m Buddy Redbud and I’m here to tell you about Oklahoma’s state tree – which is my home tree, the Eastern Redbud (Cercis canadensis). Its leaves are heart-shaped, and can emerge either red or green-colored depending on the variety of the tree. On either tree the blossoms that burst all over the branches are a pink-lavender color (as seen below). Happy Arbor Day week, Oklahoma! Did you know that each state has it’s own Arbor Day? Well it’s a fact! And today is the first Friday after March 15th, which is North Carolina’s defined state arbor day. 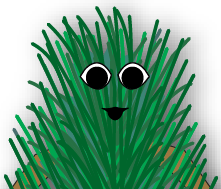 Our state tree is the pine (no specific pine) but the Genus Pinus (1963). It has great bark and the leaves are needle-like and hang in clusters of 2-5 depending on the specific variety. Be sure to look for this tree while you are out and about today. 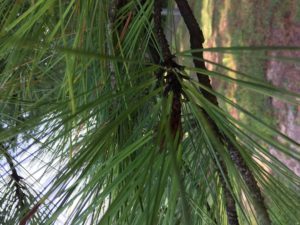 A cluster of pine tree needles. 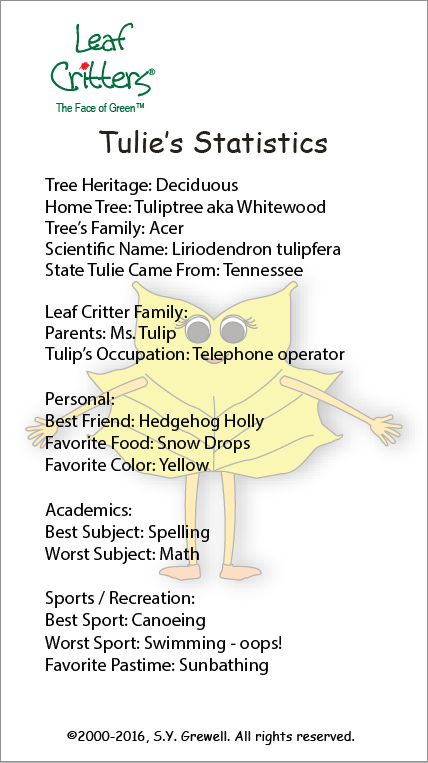 Hi – Maggie Magnolia here, with breaking news that the magnolia tree is shedding some of its leaves! We know that my home tree is an evergreen! Well, check it out, each year some of the magnolia’s leaves turn a beautiful bright yellow as they die off and leave the tree. This happens at the very same time that new growth leaves are emerging. So, it’s out with the old and in with the new – Take a look at the photo below to see it happening. 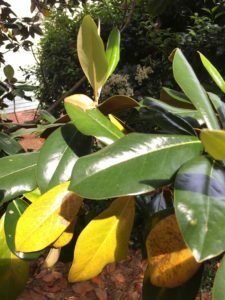 – The new growth leaves are those at the very top of the picture and the yellow ones are the older leaves that are going to fall off soon. To answer the question, How can this BE?? 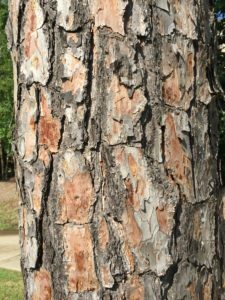 (That is, the shedding of leaves from an evergreen tree) – the answer lies in the fact that it is the tree that remains green throughout the year – not the individual leaves. Now, go see if you can find this tree in your neighborhood or school yard! Hi – Shuggie Maple here, reporting that Spring has sprung in the Southeast! And the Sugar Maple trees are dropping their fruit – those fantastic flying wings – everywhere! Take a look! 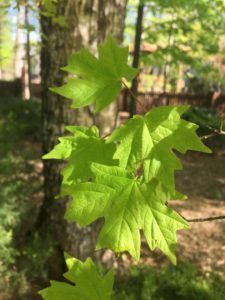 Then check out the new spring leaves from my home tree! 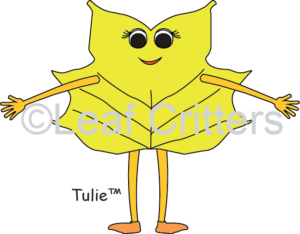 Click here to learn more about Tulie! 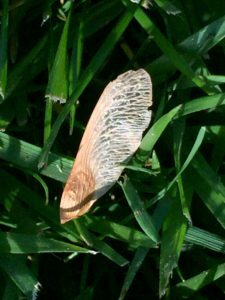 Here is what the Tulip Poplar leaf looks like. Each refers to the same tree. 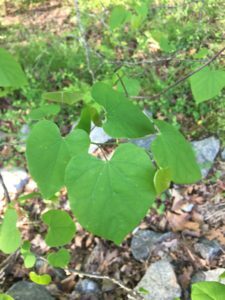 The tulip poplar is not a poplar, but a member of the magnolia family. The leaves resemble the shape of the outline of a tulip flower. They turn yellow in the fall. 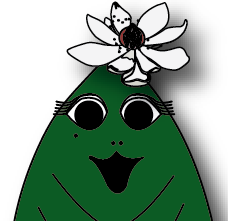 Help your students See the Trees™ with the Leaf Critters®. Or check out the brochure here. 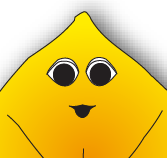 Click here to learn more about Buddy! Here is what the Redbud leaf looks like. There are many varieties of the redbud tree in North America. 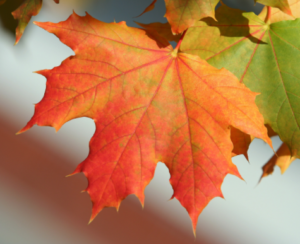 Some have green leaves in the spring and some have red leaves from spring-to-fall. 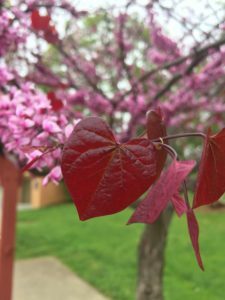 The Ruby falls weeping redbud has leaves emerge maroon-red color turning into a deeper shade of violet as summer progresses. The redbud tree flowers before the leaves emerge.